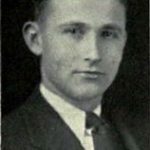 Here is a photograph of young Lawton Shank, who was posthumously awarded the Navy Cross for his heroism on Wake Island in World War II. The doctor worked steadily and at great risk to care for casualties during the siege and battle in December, 1941, and volunteered to remain on the island with the last 98 American POWs, only to be cut down with them in a blaze of Japanese bullets on October 7, 1943. I wrote about Dr. Shank a couple of years ago in Wake 98 Hero, but was unable to find a photograph to go with the post at the time. While the 1945 “Blue Book” contains head shots of many of the Wake Islanders, Dr. Shank is not among them. Recently a historian working on a project for the National World War II Museum was seeking a photograph of Shank and the query came to me via Doug Miller, webmaster of the excellent Pan Am Historical Foundation website. I searched the internet again and this time I found a good photograph from the 1936 Indiana University Medical School yearbook, which I was glad to share. Lawton Shank graduated that year with a BS in Medicine. It is an honor to be able to put a face on this Wake Island hero. The service casualty officers process all family inquiries for the Defense POW-MIA Accounting Agency (DPAA, which is the new organization that replaced JPAC in the Department of Defense). The DPAA website has good information on their mission and the collection of Family Reference Samples (DNA). DPAA also hosts regional Family Member Update meetings with speakers, presentations, Q&A, and opportunities for one-on-one conversations. Now that the Wake Island mission is under the Navy, our family members can attend, but must register with DPAA to do so. The next scheduled meetings are September 10, 2016, in Green Bay WI, and November 19, 2016, in Reno, NV. The 2017 schedule is posted at the DPAA website. We remain hopeful that something will come of the five-year quest to identify those bones, buried so long in the coral sand of Wake Island. But we will always pay our respects at the mass grave in Punchbowl Cemetery and honor the memory of all of the Wake Islanders who lost their lives in the war.